'Tis the season! What better way to celebrate, than to load up the Surf Dog Diaries land board and hit the streets? This year, it was just me, Doodle, and my pirate surf dog bro, Dude. Elvis stayed home to handle dog bone inventory. That's code for, his back hurts. This isn't our first rodeo. Elvis and Dude do parades every year.... and before that, our grand dog Howdy Doody, rode in parades back in California. I'm pretty new to the parade thing but whoa, what a ride. Awesome photo by Blaine Franger - buy some of their killer scenic images, will 'ya? 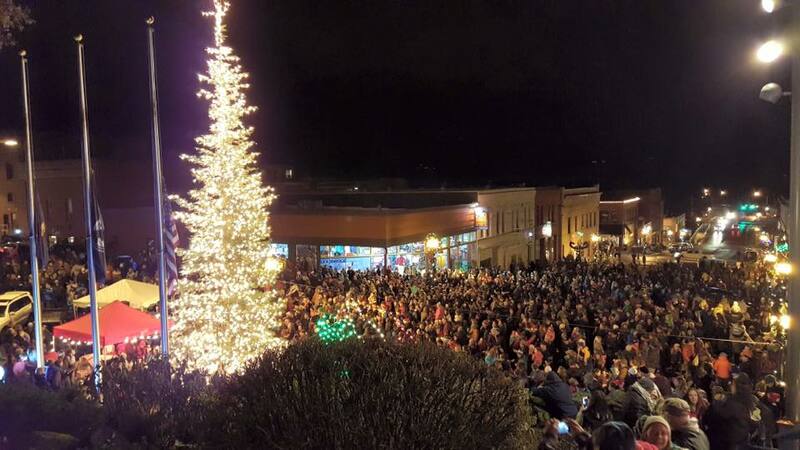 Check it out, our little town of Hood River, Oregon, population of less than 20,000 - and every single human was down there on the street in the freezing cold, to celebrate. For sure, every kid was there because we got mauled by about 5,000 kids after the parade. I got lots, but the kids always seem to really dig on Dude, who is blind. Together, we sang carols and counted down to that special moment when the community Christmas tree lights up the sky. This is why we live in a small town. The spirit of community, our togetherness, how we feel about our home town, how we help each other out, makes our town so much bigger than a big city could ever hope to be. Dude and Doodle - both of us got our names from Howdy Doody. He was the king of Dog Beach in our old home town. Howdy and mom ran events and co-chaired the Dog Beach Committee of Ocean Beach (OB) Town Council, and fixed up Dog Beach. Here's Howdy and Santa, riding the Dog Beach break. You really need to know more about OB. One of those small towns that gets into your blood and never leaves - like Hood River. There, Howdy surfed in a club called the Ocean Beach Geriatric Precision Surfboard Drill Team and Gidget Patrol. But that's another story. Elvis, when we lived at Dog Beach. Merry Christmas, everyone, or whatever else you believe in. Just believe. Hug a warm puppy. Reach out - tell those you love, what is in your heart. We are all on this beach together.